In 1947 some fossil hunters discovered a skull in the Lance formation of southern eastern Montana. The skull was that of a theropod or meat eating dinosaur. It was placed in the always dubious taxon Aublysodon (dubious because it was based on teeth, which are not diagnostic in dinosaurs). It sat in the collections of the Cleveland Museum of Natural History for the next several decades. In 1989, Robert Bakker and Phil Currie examined the skull and used it as the basis of a new species: Nanotyrannus lancensis . Dubbed the “pygmy tyrant”, it demonstrated the presence of another large predator in the latest Cretaceous of North America (previously only Tyrannosaurus rex was known). It differed from T. rex in being much smaller with a more lightly built skull, more teeth, and other distinguishing features. The description stuck for a while before the back and forth began. 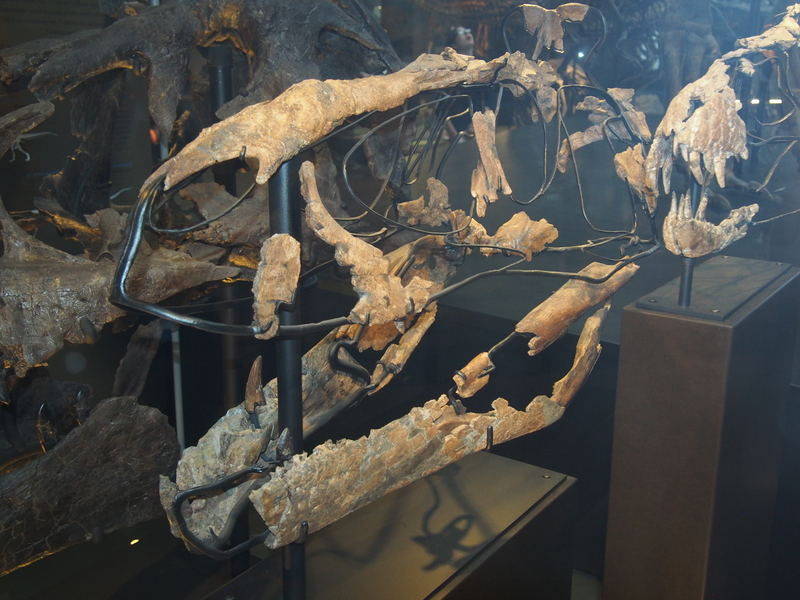 Cast of the holotype skull of Nanotyrannus lancensis. On display at the Raymond Alf Museum of Paleontology, Claremont, California. Some didn’t think Nanotyrannus was a valid taxon. They thought it was nothing more than a juvenile T. rex. According to them all the features used to separate it are the result of ontogeny, not speciation. But with only the one skull and no definite juveniles of T. rex to speak of, the debate didn’t really go anywhere. Books and the like always listed the species as up in the air, with some thinking it was a separate species and others that it was just a juvenile T. rex. It wasn’t until 2001 that the debate really got started. A crew from the little Burpee Museum of Natural History in Illinois was prospecting the Hell Creek Formation in eastern Montana. One of the crew members discovered a bone poking out of a hill. It led to the skull and partial skeleton of a young theropod. The find, named “Jane”, put the Burpee Museum on the map. It was hailed as the long sought-after juvenile T. rex. The specimen promised to answer not only questions about Tyrannosaurus growth but put the Nanotyrannus debate to rest. It was not meant to be. Skeleton of Jane at the Burpee Museum, Rockford, Illinois. From Flickr user Amy Meredith. Proponents of Nanotyrannus pointed out the features shared by Jane and the Cleveland skull as evidence that Jane was a Nanotyrannus. Species named from a single specimen are always in doubt unless the case is rock solid. A second specimen is usually needed to clear things up. Jane, they thought, was that second specimen. But the opposition pointed to her apparent immature nature (histology revealed she was 11 years old when she died) as proof that she was instead a juvenile T. rex. And that that fact sunk Nanotyrannus once and for all. But, science is ever fluid. All can change when new evidence is discovered. A discovery was made not in the field but in the collections of a museum. The Natural History Museum of Los Angeles County had in the 60s and 70s hired a man named Harley Garbani to find dinosaurs for them. 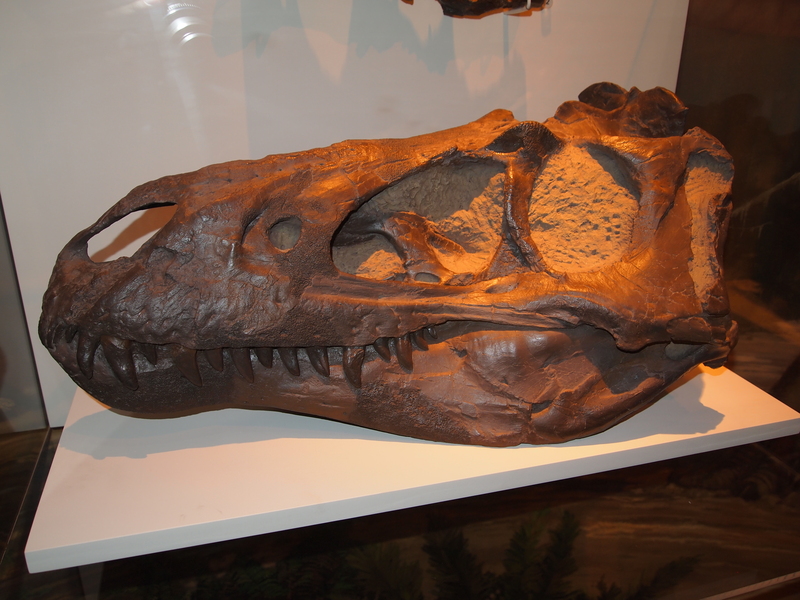 Over his decorated career he found many prized specimens for the museum, including a complete T. rex skull. He also found a partial skull known as the “Jordan Theropod” and a partial skull and skeleton of another theropod. These were first described as their own species . But research decades later found them to be different growth stages of T. rex. The Jordon Theropod was then the youngest T. rex known at an estimated 2 years old. The other was a teenager roughly the size of Jane. Though fragmentary, they offered clues into T. rex growth. They helped show that T. rex grew up fast and died young. But where did they fit into the Nanotyrannus debate? The skull of Jane compared to the L.A. Museum’s specimen. Well that led nowhere. Now in 2013 I went to my very first meeting of the Society of Vertebrate Paleontology. Paleontologist Pete Larson made waves at that meeting with a poster about a specimen that could turn the debate. The specimen is a nearly complete tyrannosaur from the Hell Creek formation. Together with a nearly complete ceratopsian found right beside it, they came to be known as the “Montana Dueling Dinosaurs”; the tyrannosaur was nicknamed “Bloody Mary”. With pictures on his tablet and a cast of Bloody Mary’s arm, Larson made his case to any who would listen that this was in fact Nanotyrannus. He argued not only the well established differences but also new ones revealed by the specimen. Using his cast he showed that Bloody Mary had completely different arm morphology than T. rex. The proportions are different, with Bloody Mary’s being larger, a differently shaped humerus, and a second phalanx on the end of it’s vestigial third finger. If you looked at the two arms side by side without knowing what the other was, you would think Bloody Mary was a different species. Larson also argued that the neck proportions are different between the two. And then there is the matter of tooth count. He noted that Tarbosaurus (a close relative of T. rex. So close, in fact, that some consider it to be a species of Tyrannosaurus) doesn’t decrease it’s number of teeth as it grows. I wonder if this has been explored in any other tyrannosaurs for which we have different ages (like Albertosaurus and Gorgosaurus). To top it off, Larson said Bloody Mary, a presumed Nanotyrannus, clades more with Gorgosaurus than T. rex. Personally, this is what was turning me to the Nanotyrannus side. Larson wasn’t just arguing for a different species. He was arguing for a different clade . Whether he is right or not may never be known with Bloody Mary’s fate up in the air (more on that later). But at least he was nice enough to upload his poster to the internet. Arm from a subadult T. rex at the University of Chicago. Close up of the hand. Note lack of a second phalanx on the vestigial third finger. 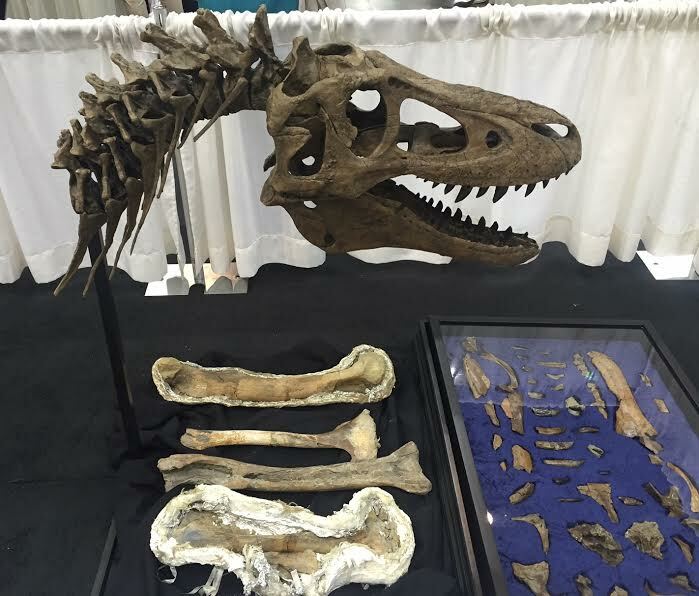 At SVP in Dallas in 2015, one Thomas Carr gave a talk on how an analysis of Jane proved Nanotyrannus is sunk. He came off as rather arrogant, as if HIS research was going to settle the debate once and for all. However, the study itself is yet to be published (that I know of), and unless the transcript of that talk is made available we can’t discuss its merits much. Age is another issue. 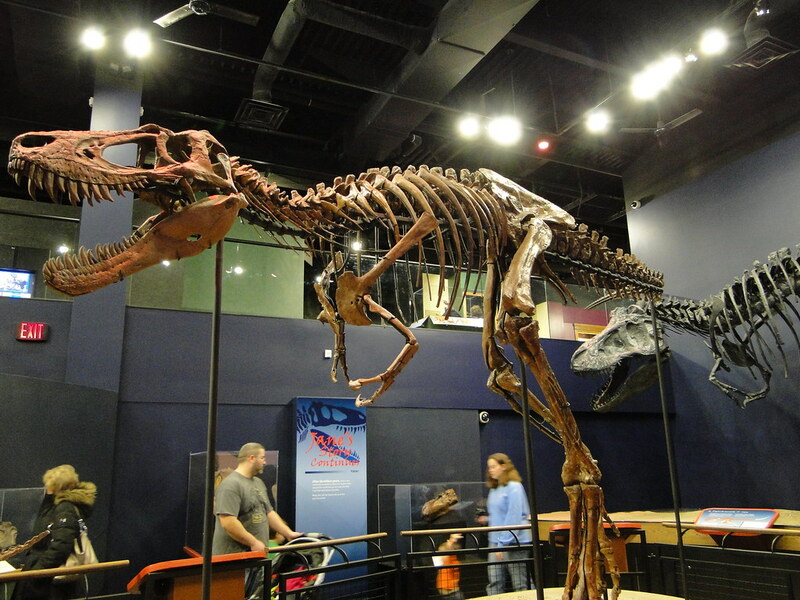 Scientists have been able to cut into long bones (either limb or rib) to discern a dinosaur’s age. The whole of T. rex ontogeny is based on it. Now with no post cranial remains we cannot do this to the Cleveland skull. It has been done with Jane, giving us an age of 11. According to the growth studies, T. rex hit maturity around 20 years old (and that’s as far as most of them seemed to get). At that age they weighed between 5 and 6 tons. Nanotyrannus is thought to have been only 1 ton. Now in nature, large animals tend to live longer and thus reach maturity slower than smaller ones (not always, but generally). The age of Jane has always been used as evidence for her being a juvenile T. rex. Eleven years old puts her close to the middle of the T. rex growth curve. Eleven may seem young for a T. rex, but for all we know it could be near adulthood for Nanotyrannus. The age may not make the identification as many contend. We need more specimens if we are to ever sort this out. Aside from the aforementioned specimens, the only other remains attributed to Nanotyrannus are shed teeth found in micro sites and associated with the remains of herbivores. One site produced thirty Nano teeth, which some have argued means they were pack hunters (since that’s more than any one individual can have at a time). Of course, this only shows multiple individuals visited the carcass; when each one did we don’t know. Dinosaur teeth can’t tell much about the animals themselves. So it would appear that Nanotyrannus is stuck being bickered over until the end of time. That is, if only certain specimens ever made it to science. Remember Bloody Mary from earlier? Well she and the ceratopsian she was found with were excavated and prepared by a commercial outfit. The problem with commercial outfits, as I have detailed many, many times before, is that there is no guarantee the specimen will end up in a museum (so it goes when money is the primary concern). In 2014, the Montana Dueling Dinosaurs were put up for auction (with a reserve price of $9 million). The reserve price was not met (one article said they were offered $5 million) and last I heard the specimens were wrapped up in a legal dispute. So who knows what will happen to them. Hopefully they will go to a museum where they belong. But fortunately (or unfortunately) Bloody Mary isn’t the only specimen that could help clear things up. A model of the Montana Dueling Dinosaurs depicting how they were found. Bloody Mary is on the right. There is one specimen described as being a juvenile T .rex that made headlines almost 10 years ago. The specimen was dubbed “Tinker” after the nickname of the guy who found it. It was found by a commercial collector in South Dakota in 1998. The problems arose because the specimen may have been illegally collected . I guess that got sorted out since there was talk of sending the specimen to auction. The story went dark and there wasn’t much information afterwards. The last I could find was he was being put up for sale in Abu Dhabi (in 2014). The guy said he wanted to put it in a museum there. No idea if that ever happened. Though at 28 feet long with a 34 inch skull, he’s really more of a sub-adult than a juvenile. Nonetheless, Tinker could have offered more information on T. rex growth that may never come to light. 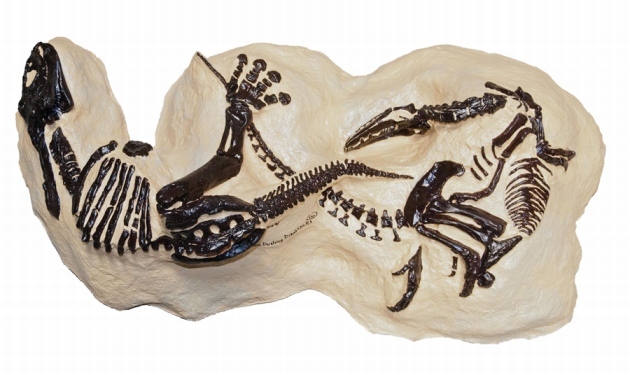 Poking around the internet led me to this FossilForum thread about a juvenile T. rex nicknamed “Baby Bob”. Baby Bob was found by a commercial outfit and even made an appearance at the Tuscon Gem and Mineral Show. This Fossil Forum thread indicates that Baby Bob is in fact the specimen that was on display at the University of Kansas. The discoverers are adamant that they want to try and get it into a museum. But given the crapfests involving “Tinker” and the Montana Dueling Dinosaurs, I’ll believe it when I see it. Commercialists love to declare that they play a vital role in paleontology but considering all the cases they botched over the years they have a lot of goodwill to build before the paleo community will take them seriously. Fossils are priceless relics of the ancient earth, not cash cows. I mean, look how much potential their specimens have to solve one of the longest running debates in modern paleontology. Yet they can’t because their owners slap price tags on them, almost always out of the reach of museums. They say money isn’t the reason. But if that is the case, then why did the owners of the Montana Dueling Dinosaurs refuse a lower offer? If that covered all the expenses and landed the specimens in a museum, shouldn’t they have done it in a heartbeat? Hell the guy who found them said he thought they were worth $15 million (remember, they were auctioned at $9 million). It’s greed plain and simple. If money is so important, then donate the specimen to a museum and make it a tax right write-off. Most museums are registered 501 non-profits so any donation is tax deductible (at least in theory). Everyone wins in that scenario. But because all these specimens remain in private hands, with no indication they could end up in museums (except the Kansas one, if the rumor is false and they do indeed own it), Nanotyrannus as a species may be doomed to reside in taxonomic purgatory for all eternity. Reconstructed skull of Baby Bob along with the original fossil material on display at the Tuscon Gem and Mineral Show. Nanotyrannus has had a rough ride. And it aint gonna smooth out any time soon. Many are steadfast that it has a leg to stand on, and others are convinced it’s deader than disco. And, any and all saving graces are tangled in the greedy fingers of non-scientists. I have long hoped Nanotyrannus is valid, because then it would put another large predator in the Hell Creek ecosystem (There are valid arguments that “Dakotaraptor” is not valid). The large carnivore guild of Late Cretaceous North America is so goddamn boring. It’s just a tyrannosaur and that’s it (because dromaeosaurs most likely took small prey, oviraptosaurs took small prey at best and were more likely omnivorous, and ornithomimosaurs were omnivores at best. I could just be jaded because of the diverse carnivore guilds found in the Cenozoic). Nanotyrannus would inject some much needed diversity into one of the most well known and studied fossil localities on Earth. I pray those other specimens can make their way into the academic sphere. They seem like they can really resolve this conflict once and for all. They would finally give Nanotyrannus that much needed paddle. – One Tracy Ford has notified me that CT scans of the Cleveland skull show that the brain case is different than that of Tyrannosaurus. Do any animals change the shape of their brain through ontogeny? * According to Kyle Atkins-Weltman, the Kansas museum has two juvenile T. rexes. He says they have one of their own (didn’t specify if it’s the one I mentioned though it probably is) and are making casts of the “Baby Bob” specimen that will be entered into their collections. I feel it should be the other way around: the museum gets the original and the private party gets the cast. But at least a cast in a museum is something. – According to Pete Larson’s twitter, the Black Hills Institute has a small tyrannosaur first metacarpal that doesn’t match up with that of T. rex. According to him it’s a dead ringer for the metacarpal of Bloody Mary. Except this new bone is much smaller. If the id is correct, this could be the first confirmed juvenile specimen of Nanotyrannus. 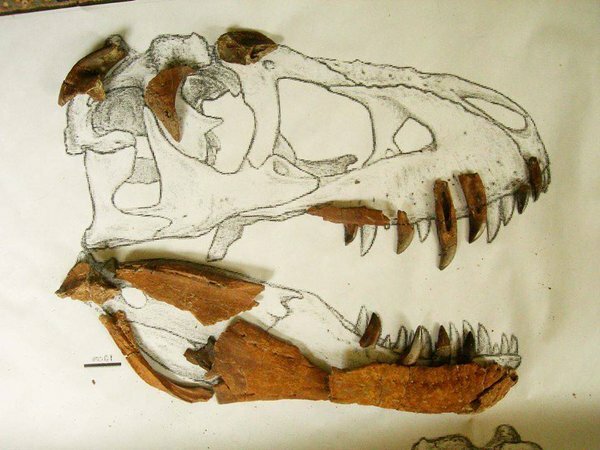 This entry was posted in Critters Abroad and tagged auction, commercial, different species, Dueling Dinosaurs, fossils, growth, Hell Creek formation, Mesozoic, Montana, Nanotyrannus, ontogeny, paleontology, sale, T.rex, tyrannosaur, tyrannosaurus rex by accpaleo. Bookmark the permalink. How can I graduate from “rather arrogant” to “fully arrogant”?! Just keep doing what you’re doing. I’m sure you’ll get there eventually. You missed a big difference between the two. Larry Witmer x-rayed braincase of Nanotyranus and it is different from Tyrannosaurus rex. 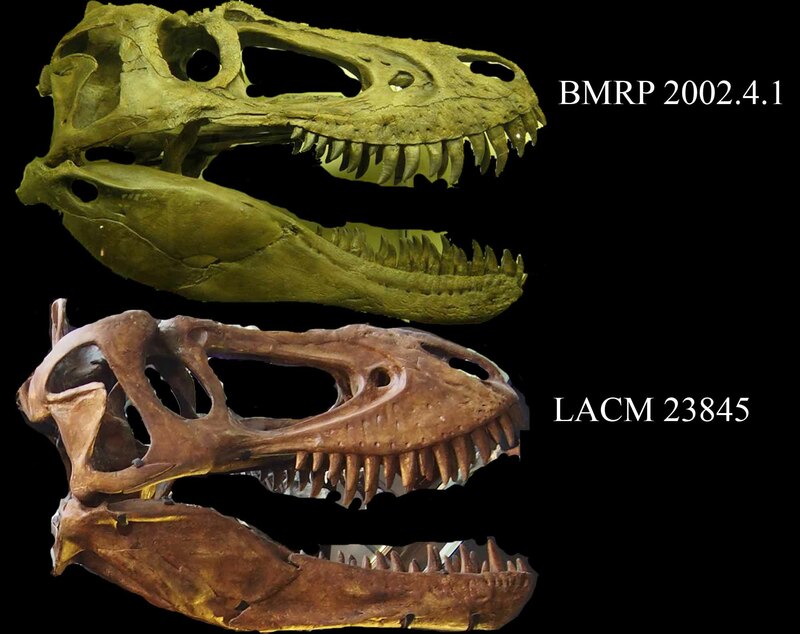 In the adult stage, Tarbosaurus has smaller teeth than Tyrannosaurus. It is therefore possible that they didn’t grow with positive allometry and therefore didn’t crowd each other out in ontogeny. Similarities to Albertosaurus and Gorgosaurus will be hard to tell apart from indicators of immaturity. It is very common in biology that derived features show up late in ontogeny. Putting juveniles into a data matrix and scoring them at face value routinely makes them come out too close to the root in phylogenetic analyses. The “dh” in Abu Dhabi stands for the same sound as the English th in the, this, that. While the distinction between that sound and the th of thick, thin, think is largely predictable in English, it is not at all in Arabic, so transcriptions tend to keep them apart as dh vs. th. I note Wyrex’s fingers are not preserved. Are there other Tyrannosaurus arms in that size range that have fingers as small as these, much smaller than Bloody Mary’s? As you can see from the fact that his first name is Thomas, Thomas Carr is one of the top experts on tyrannosaurids. (I’m not joking.) Transcripts of conference talks are never made available; instead, conference talks usually become papers, and that can take three years. Maybe we’ll know more later this year or next year. Can you tell us more about the doubts about Dakotaraptor, or is all that embargoed? Yes, because if Donald Prothero complains about something it must be a problem. The guy’s practically the Cenozoic version of Jack Horner. You’d have to ask Larson why he used Wyrex in that example. But both Sue and the Wankel rex have complete arms so he could have easily just filled it in using those as models. Doesn’t matter. A top expert can still be wrong. Louis Leaky was considered one of the top experts on prehistoric humans and yet he thought the Calico Early Man Site was legitimate. Jack Horner is considered one of the top experts on dinosaurs and his ideas about T. rex being a scavenger and “Toroceratops” have been soundly refuted. Pointing out that someone is considered a top expert (and trying to reinforce it with a “i’m not joking”) as an argument is nothing but an appeal to authority. Not a tactic that will get you far in any debate. The strength of one’s argument relies on the evidence, not how much of a supposed big wig they are. Just what i have heard in idle chats. The main hang up comes from the fact it was found in a lag deposit where everything gets jumbled together. Thus they think it’s a chimera (i mean, we already had the fercula turn out to be a turtle shell). KU actually has two juvenile T rexes – the ‘Baby Bob’ specimen is on loan (casts are being reposited), while we have collected one of our own as well. I cannot go into details as we are working on a publication, but both specimens are currently here. got it thanks for clearing that up!